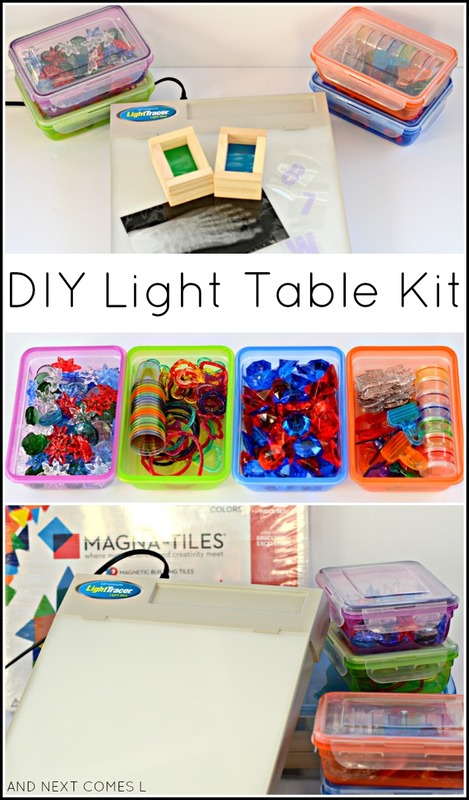 We recently put together a DIY light table kit for kids as a gift for Christmas. We decided to share the gift of light table play with a local charity this past Christmas, hoping it inspires some new kids to explore and learn through sensory play. 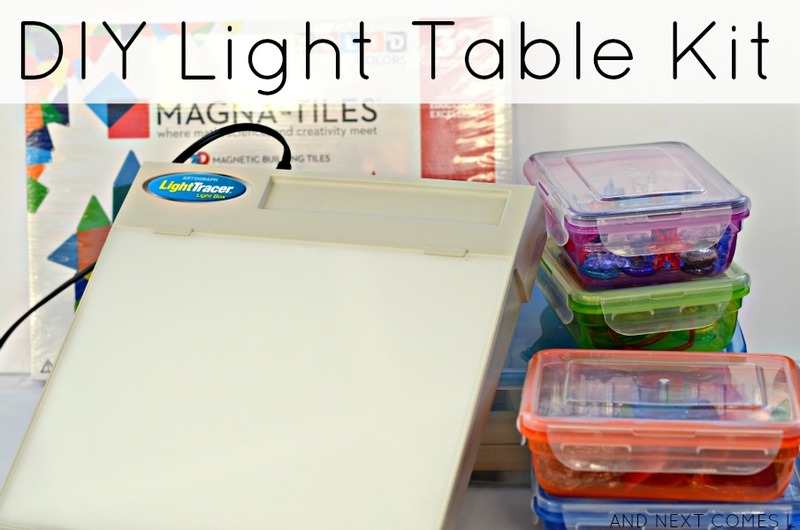 Besides the light box and the Magna-Tiles, this DIY light table kit can be put together using materials found at the dollar store. That means you can put together a light table kit that fits any kind of budget. Like I mentioned, we made this DIY light table kit for a local charity. We chose Family Service (city name left out to protect our location). They recently renovated their child care space and were in need of toys and supplies for their new space. It's a cute, but tiny space. So I needed to put together something that wouldn't be too bulky. We also partnered up with Magna-Tiles by Valtech to provide a set of Magna-Tiles to Family Service, as was announced here. So not only did we provide Family Service with a kit to enjoy one of our favorite sensory mediums, but we were able to hook them up with one of our favorite toys: Magna-Tiles. Artograph Light Tracer Light Box - We used this light box up until we built our light table. I originally purchased it from Michael's using a 50% coupon. So it is an affordable option if you don't want to go the DIY route. Homemade light table manipulatives stored in a large clear bin from the dollar store, including x-rays, alphabet and number cards, and DIY color blocks (see below for more details on how they were made). Translucent heart bracelets - I found these at Target around Valentine's Day. The bonus to using colored containers like I did is that they can be used on the light table too! They are great for color sorting or even to practice fine motor skills by clipping the chip clips to the container's edges (like we did in this activity). Then the materials can easily be packed into their handy containers, making storage a breeze. For this DIY light table kit, I included some laminated alphabet and number cards. I made the translucent letters using this tutorial, but laminated them for extra durability. I also printed and laminated a set of these printable x-rays from Tried & True. They look fabulous on the light table and I even made a set for my boys at the same time. And, of course, no light table kit would be complete without a set of my homemade color blocks. I laminated the translucent dividers first for extra durability because I wanted to make sure they would last for a few years. I have no idea how many kids will be handling all these DIY materials so it's better to be safe than sorry.